Our personalized logo Flat Back Rib Pullover offers protection against abrasion and mildew. Our Women's Vansport Mesh 1/4-Zip Tech Pullover Sweater is durable, and resistant to wrinkles and shrinking. The branded Core 365 men's pinnacle polo shirt has matching flat knit collar. Our promotional Core365 men's origin pique polo has a matching flat knit collar and heat sealed label. Our promotional Extreme performance ladies launch striped polo has a matching jacquard knit collar. This custom logo Extreme performance ladies shift polo has a pen slot located on left sleeve. This custom logo Extreme performance ladies pique colorblock polo has a one-button placket. The branded Extreme performance ladies short sleeve pique polo has contrast color neck tape. The branded Extreme performance ladies textured polo has contrast white inserts at front and back. 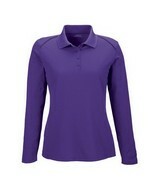 Our promotional Extreme performance ladies long sleeve armour polo has snag protection for long life. This custom logo Extreme performance ladies’ shield polo features a four-button placket and matching flat knit collar.